(Newser) – The next incarnation of Ford's F-150 will be as tough as … aluminum? By 2014 the company will be building most of the body of its signature truck out of that lightweight metal in a bid to boost its fuel economy, in what the Wall Street Journal calls "one of the biggest gambles in its 108-year history." The aluminum body will weigh about 700 pounds less. That alone will improve efficiency, and it could pave the way for smaller, more efficient engines. I wonder if it would be feasible for them to build them with aluminum bodies as an option for a while and see how the market responds. -sigh- If only Ford could get back to manufacturing car bodies from fibrous hemp-based plastics/plaster. Ford's 1941 musket car even ran on hemp ethanol. Lighter than steel, yet could withstand 10x the impact without denting. There is just no reason for us not to take full advantage of (at least) industrial hemp. Watch what happens to aluminum when its close to salt air. Not a pretty picture. 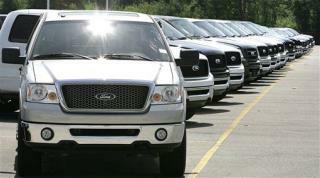 Ford should focus its attention on building smaller pickups, and powering them with high efficiency diesel engines. The day of the dinosaur pickup is over.